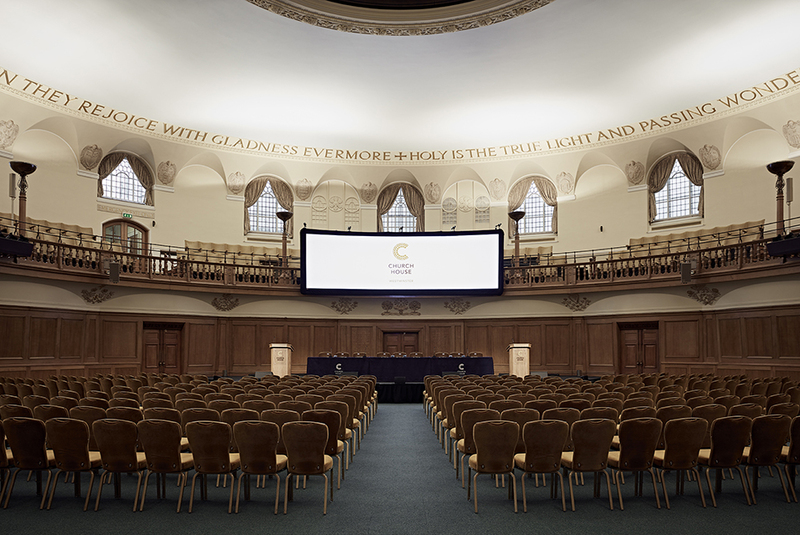 The largest event room at Church House Westminster is the Assembly Hall which has a theatre style capacity of over 600. The hall is round in shape and has an impressive domed roof and oak panelling. 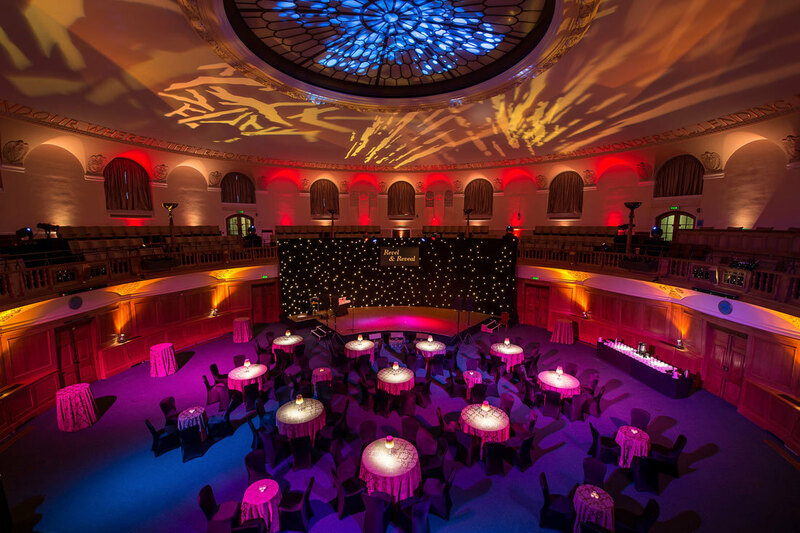 Designed by world renowned architect Sir Herbert Baker, the Assembly Hall is the impressive centre piece of this central London venue. The room is split over two levels a capacity of 468 on the lower level and 132 in the gallery, which runs around the whole room. On the gallery level there are 15 arched window giving natural daylight, alternatively the room can be darkened if required. The Assembly Hall was originally built to hold the General Synod, the legislative body of the Church of England. 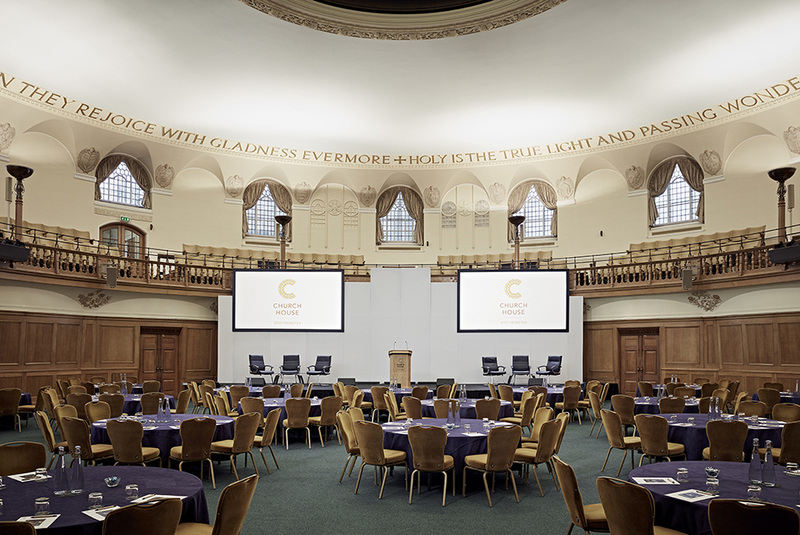 Synod still takes place at the venue over a week in February each year, however the rest of the time the 19 rooms that make up Church House Westminster become one of London’s most popular conference and events venues. The Assembly Hall is not only the largest event space in the venue but also the most flexible. As a meeting and conference room, the Hall can seat up 600 people theatre style over the two levels. For a cabaret style meeting the capacity is 208 on round tables with a maximum of 8 delegates per table. The room can also accommodate large drink receptions for up to 500 guests. The design of the round room with its eight entrances is perfect for the serving of drinks and canapes, assuring that all guests are served promptly. With a dining capacity of 372 the plentiful entrances also assure a smooth service for dinner. Assembly Hall is most often hired/used as a dinner, dinner dance venue and award ceremony venue. 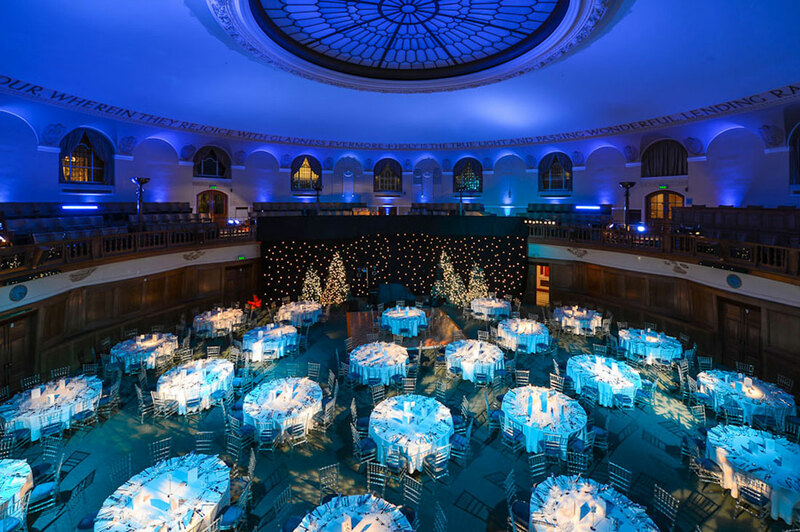 With an excellent selection of menus provided by our inhouse catering team, Church House is a stunning Central London venue for dinner. With a maximum capacity of 372 for dinner and 300 for a dinner dance, dining under the dome of this spectacular room provides an amazing setting for an evening of fine dining. All events within the Assembly Hall are supported by our excellent in-house Audio-Visual team. While the building itself has huge historical interest, the technical infrastructure is among the best in London, and nowhere is this more apparent than in the Assembly Hall. Two Ultra HD 4K projectors throw out crystal clear images onto a variety of different screen set ups, while a state of the art D&B sound system provides the highest quality sound. With four fixed remote cameras and a video cast encoder permanently installed web streaming of any event is available. 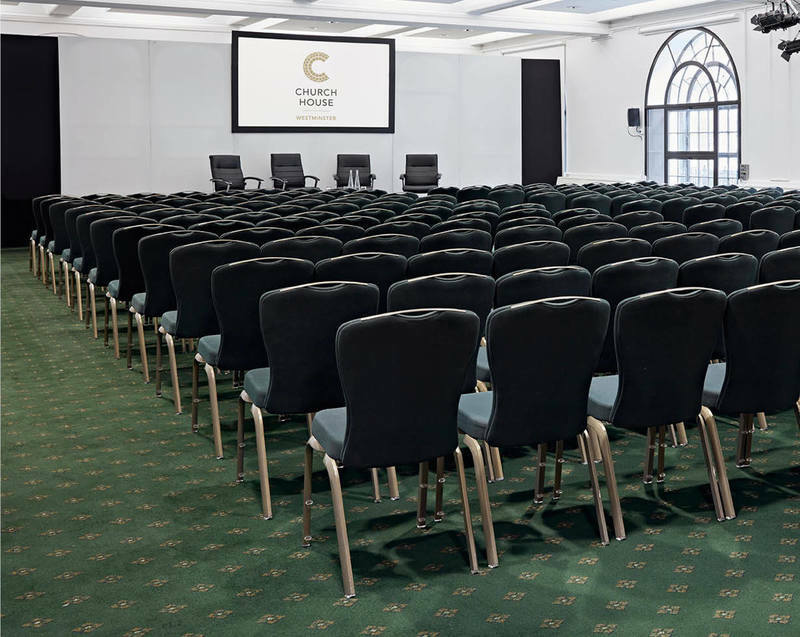 If you have any questions regarding our conference venues in Westminster, please call us on 020 7390 1590 or fill in our contact form.